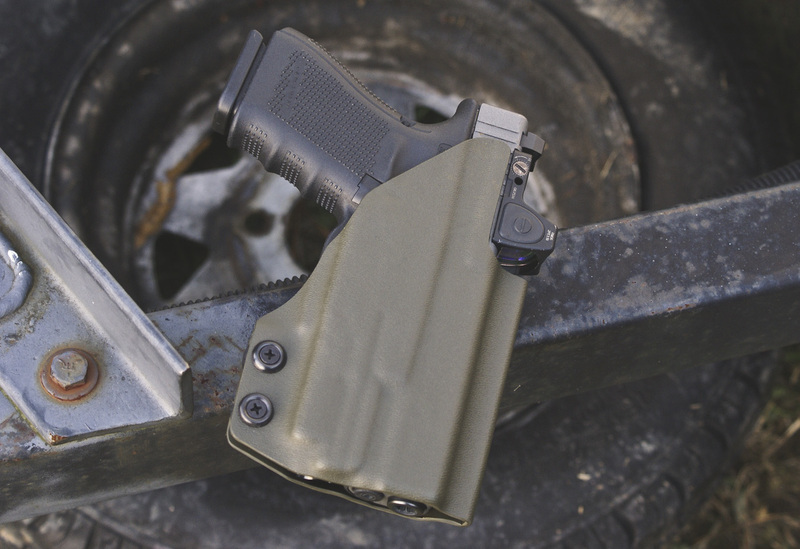 Check out our Holster options for the Glock 19 with O-Light PL-Mini. Above is our Optic cut Light bearing OWB Holster. This holster can be highly customized to accommodate your after market modifications. Optics, suppressor height sights, suppressor-ready firearms, extended controls- we've got your back. The Glock 19 above is the gen 4, with a Trijicon RMR and co witness sights. The holster accommodates the O-light PL-Mini light attachment- a newcomer to the WML market. These holsters come in a variety of colors- OD Green pictured. The O-Light PL-Mini is a great little compact light. Our OWB Holsters, while not intended for concealment purposes, stick close to the body in a streamline minimalist design. There are a variety of belt attachment options, including the single loop (pictured), double loop and paddle. Every Dara Holster comes standard with a Military Grade Rubber Retention System. This system was designed by us, to be used specifically with our holsters. This system is able to hold the most minute retention adjustments, allowing the end user a truly custom experience. Our OWB Holsters comes with three options for muzzle coverage. Flush (shown above), which ends the holster material flush with the muzzle. Slight Wrap, which has the holster material slightly wrapping around the end of the muzzle; and Full Wrap, which has the holster material fully wrapping around the muzzle end, nearly enclosing it. Each holster is custom made to order using the exact specifications chosen on the order form. If you have any questions during the ordering process, please don't hesitate to reach out to Customer Service!